I remember being impressed a couple of years ago by a batch of of titles from Bayard Magazines, and I noticed recently the review copies are still being eagerly browsed in various book corners they were left in. I have just been sent some samples of recent editions from the three "Box" publications: Discovery Box, Adventure Box and Story Box. Aimed at 9-12 yearolds, Discovery Box is produced in tall portrait format, on glossy magazine style paper, with eye-catching page designs and great colour illustrations. As Simona Sideri, the series editor, says in a brief video on the above weblink, Discovery Box aims to provide homebased support to the subjects children learn at school. Each edition has a good mix of cartoons, quizes and how-to-make-it pages, amongst the information content, and every issue is helpfully colour indexed by subject in the topright page corners. Recommended for the browsing areas of KS2 libraries and classrooms. This book has done something important for me. And it has done it in a way so utterly and compellingly convincing that I shall henceforth consider Marcus Sedgwick a writer of the very highest order. I know others have long held him in that regard. I have admired some books of his, but none has registered that complete sense of satisfaction that you get when you read a book by a master of their trade. Let's be honest, few books do this completely. Two of my lodestars that I use when I have finished a book I have enjoyed are Robert Cormier and Sonya Hartnett. Yes, I think to myself, this book was good, but was it that good? Well, I have to tell you that Revolver IS that good. And for the life of me I cannot imagine the conversation that must have gone on around the table between the judges of the Guardian Prize (to be announced on Thursday 8th October) that led to Sedgwick's book failing to make the crossing from longlist to shortlist. It is a shocking omission. This book should be on the shortlist of each and every fiction prize of the coming year, and that includes adult lists, because the story it tells is entirely unpatronising. If any book deserves to have 'crossover' success, it is this one. Fans of Cormac McCarthy, viewers of Deadwood alike will find familiar themes confronted with a moving, moral grandeur. Judi James - Chair of Judges, comments:"Judging the Booktrust Teenage Prize has been a fascinating journey. The shortlisted books represent a diverse range of titles with one thing in common - they are all written by talented authors who should be celebrated! It is this remarkable quality of writing and storytelling that lures you into their extraordinary worlds, where gloriously authentic characters and intriguing events captivate." The winning author will receive a cheque for £2,500 and a trophy at a ceremony in London on 18 November. Frances Lincoln Limited, the award-winning publisher, and Seven Stories, the Centre for Children's Books, are proud to announce the second Diverse Voices Award in memory of Frances Lincoln (1945 - 2001), to encourage and promote diversity in children's fiction. Continue reading Frances Lincoln Diverse Voices Children's Book Award . Jon Scieszka on his newly redesigned website which aims to help boys become readers: "GUYS READ, The Website is new, fresh, improved. Less calories, no artificial flavors, way more book titles. And now you are here. This all looks so good because it has been designed by Sam Potts." Continue reading Astrid Lindgren Award 2010. Samantha Swinnerton and Rebecca McNally at MCB have acquired two books by debut author Sita Brahmachari. ARTICHOKE HEARTS is a novel about family, friends and losing someone you love. 'Sita has that rare gift for making you feel that her characters are your best friends - this is an incredibly touching, first-person, real-world novel, with a gloriously diverse London as its backdrop. I think she's going to be a very exciting and important writer,' said Publishing Director, Rebecca McNally. Brahmachari is a playwright, arts education practitioner and mother of three. Macmillan acquired world rights from Sophie Gorell Barnes at MBA. The selection from The History Press contains the most gruesome tales from this 185-year-old publication. Many of these tales have not appeared in print since Charles Dickens himself read them. Richly illustrated with original woodcuts, it will fascinate anyone with an interest in true crime. only suitable for older, bolder readers...!
. : : Roald Dahl Day : : . Since the end of August, Melvin Burgess has been developing a storyline in tweeted mini episodes. I haven't been following closely thus far, but todays 'episodes' have been compellingly disturbing. Juila Eccleshare writes: "Four stunning titles have been shortlisted for the 2009 Guardian children's fiction prize, reflecting both the breadth of writing for children and young adults and an optimism about the power of story to inform and guide." Of the books lost from the longlist, the most surprising departure is Marcus Sedgwick's Revolver. to tie in with announcement of the shortlist for The Roald Dahl Funny Prize (made earlier this week), and with Roald Dahl Day (tomorrow - Spetember 13th). The Roald Dahl Funny Prize was founded in 2008 by Michael Rosen as part of his Children's Laureateship. It is the first prize of its kind; founded to honour those books that simply make children laugh. The winner of each category will receive £2,500, which will be presented at an awards ceremony in London on 10 November. The judging panel comprised the comedian Bill Bailey; author, founder and Chair Michael Rosen; author and illustrator Mini Grey; author Louise Rennison; and author and winner of the Roald Dahl Funny Prize 2008 Andy Stanton. The excellent event (Fridrik Erlings in conversation with Nick Tucker - see earlier blog entry) organised by OutsideIn at the Icelandic Embassy this week reminded me how disappointed I had been not to be able to attend a similar event with Argentinean author and illustrator Pablo Bernasconi at the end of August. 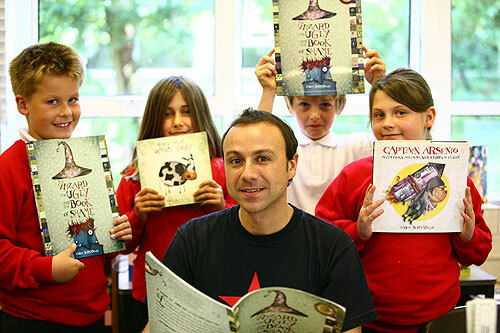 Bernasconi is pictured above during his UK visit taking part in OutsideIn's 'Reading Round the World' programme. He visited St Martin's Garden Primary School in Bath where the children created their own collage artwork. Look out for ACHUKA's own review of this book - appearing shortly. 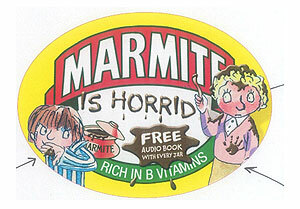 The children's book character Horrid Henry will soon be appearing on two million branded packs of Marmite (250g jars). With individual 'Horrid' and 'Perfect' labels, featuring Tony Ross's illustrations, Horrid Henry and Perfect Peter vividly capture the love it/hate it appeal of Marmite. 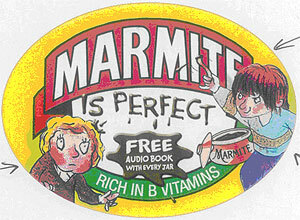 Each special Horrid Henry Marmite pack will contain a code for a free audio book download, from Audible.co.uk. There are five book downloads available, each written by Francesca Simon and read by Miranda Richardson: Horrid Henry, Horrid Henry's Underpants, Horrid Henry's Stink Bomb, Horrid Henry and the Football Fiend and Horrid Henry Robs the Bank. The promotion has been funded by Unilever, Reading For Life and Orion Publishing. 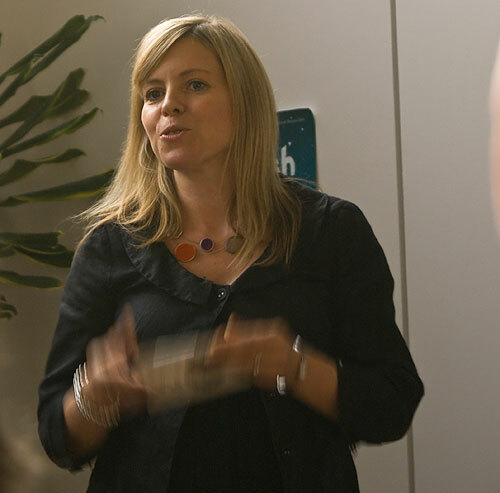 Cheryl Calverley, marketing manager for Marmite said: "Marmite is very excited to team up with Reading for Life, and the Horrid Henry stories in particular have a great resonance with Marmite fans. Whether you think Marmite is horrid (like Henry) or perfect (like Peter) audio-books are a great way to keep you kids out of mischief." Joanna Rose, Brand Manager at Orion said, "We are delighted to be working with Marmite and Reading for Life in a way that perfectly encapsulates Horrid Henry's great sense of fun." is a competition for students from around Britain to produce a piece of writing inspired by the issue of Child Soldiers. 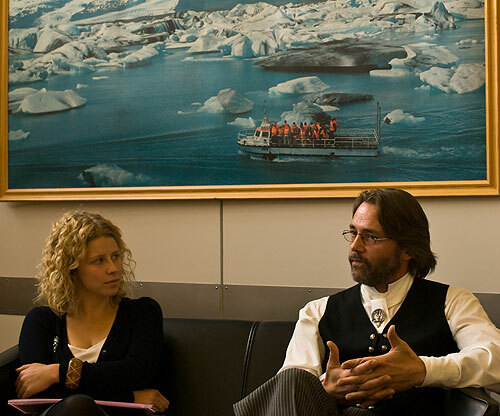 Icelandic author, Fridrik Erlings (published by Meadowside Children's Books in the UK) was in conversation last night with Nick Tucker at the Icelandic Embassy, in front of an invited adult audience. The event had been organised by Outside In, an organisation previously lauded on ACHUKA for the work it does to promote worldwide literature (in translation) to the UK audience. 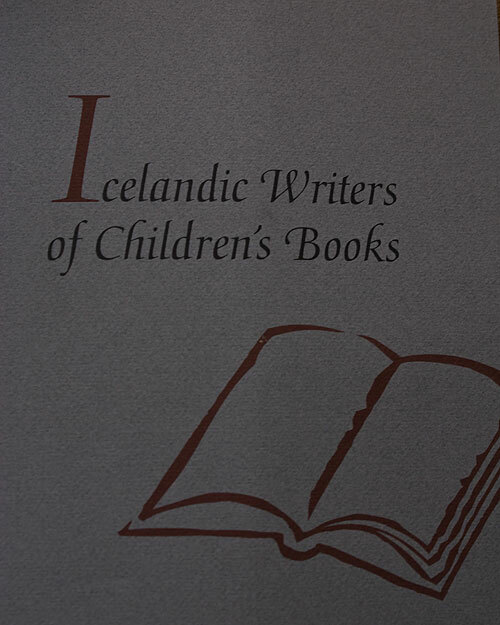 The Icelandic author was accompanied by his English editor, Lucy. Nick Tucker's questioning attempted to pick out a conflict (which he perceived) between making overseas literature specific to its place, and making it generalised enough for an international audience. He wondered what compromises in translation had to be made. The audience chuckled at one point when Lucy stepped in to explain that at times the food had to be made less 'sparse'. There were other incidental changes also. 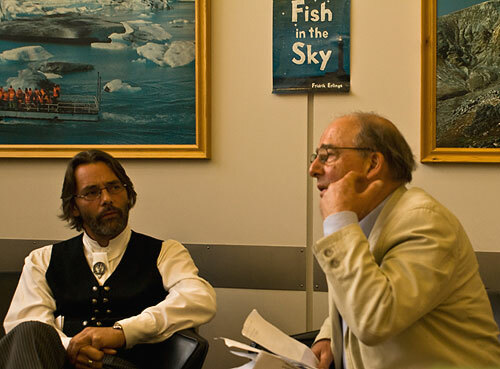 But what was most interesting in this particular instance of translation was that both Benjamin Dove and Fish In The Sky had been translated by the author himself, who explained that he had welcomed the opportunity to do some 're-writing', an opportunity which most authors would love to have. This led Nick Tucker to wonder whether there could ever be a literal word-for-word translation of the original, at which point questions and observations from the audience extended this particular discussion.